This spring I was given the opportunity to intern at Small Craft Advisory Press, housed at FSU’s Facility for Arts Research. Being able to intern at a press at my own university was an amazing experience– founding my own press is something I hope to do in the future and I was thrilled to find out that someone in our own faculty, Denise Bookwalter, had also done the same. As a studio art major with a focus in printmaking, I was fortunate to be able to implement previous skills and acquire new ones that will be instrumental to my career in the printmaking arts. During my time at SCAP, I worked closely with Elysia Mann, SCAP’s press manager. She taught me the ins and outs of all the equipment housed at SCAP, as well as the history of letterpress as an art form. 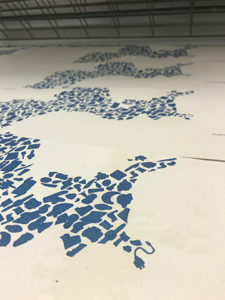 We worked on a variety of artists’ books that each involved different printing processes and book structures.The main project we worked on this semester was SCAP’s Oyster Boat series. One of the volumes we worked on was a collaboration between Elysia Mann, Denise Bookwalter, and Lisa Bulawsky. Taking part in the production of this book deepened my understanding of an artist book and the types of materials and processes that can be turned into fine art. We used everything from coffee to crayons in a controlled way that made each book in the edition personalized, yet consistent. At SCAP, we used modern ideas with historic equipment to create unique and innovative works of art. My fellow intern and I were given the amazing opportunity of collaborating with a local poet on a volume of the Oyster Boat series. This was an enlightening experience; I was able to see through the creation of a book from start to finish, which involves many steps and phases before actually seeing the final product. Being able to go through this with the guidance of someone as experienced as Elysia was extremely helpful. The experience of being a collaborating artist on this book has taught me invaluable techniques that I will carry with me throughout my art career. Being an intern at Small Craft Advisory Press has been an extremely fulfilling experience. 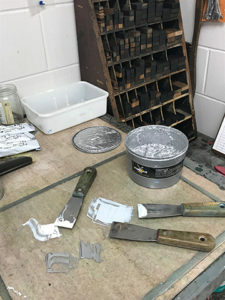 I learned processes and techniques that are instrumental to my career in printmaking and book arts. I am grateful to have been able to work under Elysia Mann and to learn the processes involved in creating books and founding presses.